Rectangular Paks are a telescopic tube packaging solution designed for a wide variety of applications. The durable protective tubes provide an adjustable ratchet-length feature that allows for a secure, perfect fit at an affordable price. Multiple applications for rectangular telescopic tubes include everything from packaging saw blades and machine knives in the cutting tool industry, electrodes in the welding industry to writing instruments in the office supply industry. A hanger option is offered for appealing hanging presentation. Telescopic tubes are an efficient and attractive packaging solution that can be re-used. 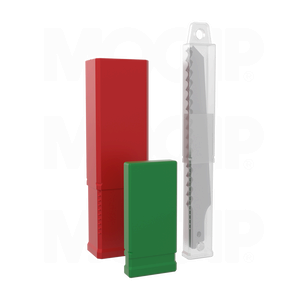 Our Rectangular Pak telescopic tubes are also available in Round, Square and extra durable RB Boxes. Rectangular Paks are available in transparent Polypropylene (PP). Additional colors and materials are available.